Bright and bold, Clarks Mitzy Skip are infant trainers that are bursting with appeal. These trainers are cute and girly and have an elasticated front / silver sparkle detail. They are made from strong leather to protect little feet. The rubber soles are non-marking. 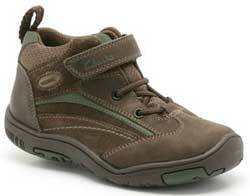 These trainers have a velcro fastening which makes them secure as well as easy to get on and off. Clarks Mitzy Skip also have antimicrobial linings and lights in the sole that flash with each step.